If you're currently building a new PC, or upgrading your current one, you'll be looking at a number of different components. 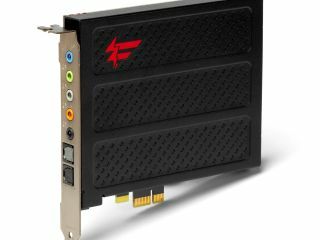 ATI's new 4000-series graphics cards might be high up on your shopping list. , on the other hand, offers raw power and blistering performance - for a price. But if you're looking for total immersion in gaming and movies, you need more than just a powerful graphics card. You need a good sound card too. Because if you're watching a Blu-ray movie through a 16-bit soundcard and 5-watt speakers, the HD experience will be somewhat shattered. And so in step the new Creative X-Fi Titanium Fatal1ty Champion and Professional Series soundcards. It's a mouthful to say, but these cards are the best of the best. Creative is the only name in the PC sound market, and it totally deserves its enormous marketshare too. It makes the best soundcards money can buy, and the the Titanium Professional Series card, along with the Champion Series, are the new flagship cards. Needless to say they sound absolutely brilliant. They come with all you'll need for HD audio, crystallising MP3s and connecting straight to your hi-fi system. And they won't cost you the Earth, either.